Knitting Like Crazy: Where Are They Now? Welcome Back for Day 4 of the 2nd Annual Knit & Crochet Blog Week. Today is all about where are your knits now? Rather than telling you about who has my handknits and whatever happened to them, I thought it would be fun to look back on something that was long forgotten. Remember this post about my Katherine Hepburn Cardigan? Um, yeah. So 3 years ago I blog about how I really want this Katherine Hepburn Cardigan. I even showed off my progress (pictured above). 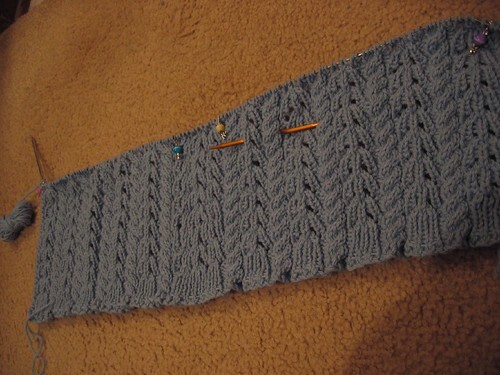 That's about as far as I ever got with the sweater. When we moved to our house in the summer of 2009, I moved it with me. Last summer though, I ripped it out, and sold the unused yarn. I was never going to finish that sweater, as much as I loved it and wanted it. I think in the last year I have come to realize that I am just not a sweater knitter. Got any good frogging stories? Did your handknits end up anywhere cool?